Pinnacle Advanced Glass Cleaner is all you need to conquer the contamination that impairs your glass clarity. If you didn’t get it from the name, the advanced formula effortlessly removes road film, insects dirt, and even smokers film. The formula for Pinnacle Advanced Glass Cleaner is phosphate and ammonia free to ensure it’s safe for tinted windows. An additional benefit of this is that you’ll never have to worry about streaks or smudges! Striving to keep perfect glass clarity can be quite the challenge. As you know, this perpetual task will just taunt you every time you get in your car, I mean it’s not like you can look away from it! To make matters worse, most cleaners you turn to for help leave a streaky, smudgy mess behind! Pinnacle Advanced Glass Cleaner was created to solve these common problems. At the heart of Pinnacle Advanced Glass Cleaners formula is an alcohol base. By utilizing alcohol in place of phosphates that have a high acidic level, Pinnacle Advanced Glass Cleaner easily cuts though smokers film and contamination. The alcohol base also aids in an accelerated evaporation, which in turn, reduces the chance of any streaking or smudges that could occur. Another factor that must be considered when choosing a glass cleaner is, “Is it safe for my tint?” Most glass cleaners use ammonia as the backbone of the products cleaning power. Ammonia is commonly used to remove tint, so yes, you don’t want to use that to clean your tinted glass! 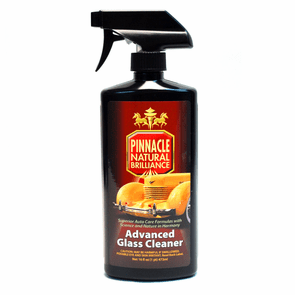 Pinnacle Advanced Glass Cleaner avoids that by using an alcohol base over ammonia to provide a safe and superior glass cleaner! For exterior glass, spray an even layer of Pinnacle Advanced Glass Cleaner onto the glass. For interior glass, spray cleaner directly onto the glass towel. Using a clean microfiber glass towel, spread the product over the surface. Flip your microfiber towel to the clean, dry side and buff away the remaining product.